Ectopic pregnancy refers to a condition in which the foetus develops outside of the uterus, usually in one of the fallopian tubes. Hence it is also called as tubal pregnancy. As the pregnancy grows, it causes excess bleeding and pain which if not detected early on, can cause internal bleeding as a result of the rupturing of the tube. This should be treated as a medical emergency which can otherwiseprove fatal.Unfortunately the pregnancy does not survive and will be removed by the doctor along with the affected fallopian tube. An ectopic is ideally detected between the fourth and tenth week of pregnancy. Why does an ectopic pregnancy happen? The exact cause of an ectopic pregnancy is unknown. 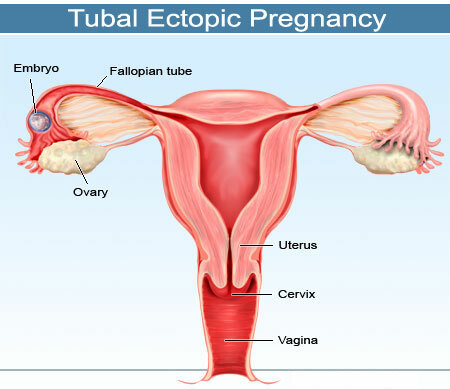 A tubal pregnancy which is the most common type of ectopic pregnancyoccurs when a fertilized egg's movement is hindered while on its way to the uterusdue to aninflamed, damaged or misshapen fallopian tube. 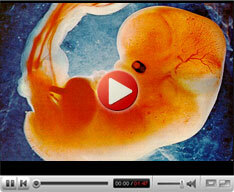 Hormonal imbalances and abnormal fetal development may also result in an ectopic pregnancy. In rare cases, the egg can attach itself in the cervix, an ovary or even in an earlier c-section scar. Another complication called a heterotopic pregnancy occurs a woman has a normal pregnancy in her uterus and an ectopic pregnancy at the same time. It happens if she has undergone fertility treatments such as in-vitro fertilization. Vaginal bleeding that is different from the normal period. A mild to severe, persistent, one sided pain in the lower abdomen or pelvis. It is not possible for a fertilized egg to develop normally outside the uterus and hence the ectopic tissue must be removed to prevent serious complications. If the ectopic pregnancy is detected in the initial stages, methotrexate injection is given to prevent cell growth and to dissolve the existing cells, following whichyour blood is tested for human chorionic gonadotropin (HCG) hormone. If the HCG level continues to be high, you will be given anotherdose of methotrexate. But otherwise, an ectopic pregnancy is ideally treated by performing a minimally invasive keyhole surgery called a Laparoscopy. Here, a thin tube equipped with a camera lens and light (laparoscope) is inserted into your abdomen to view the area, through a small incision to assess the tubes. If an ectopic is identified, the doctorwill remove it using the laparoscope, while leaving the tube intact. In severe cases wherein the tube has ruptured, abdominal surgery is recommended instead of a keyhole surgery. This is performed to remove the damaged tubes and pregnancy. In rare instances, a blood transfusion may be required to replace the lost blood.